Cruising at thirty thousand feet above the endless green 1.the island seems like dice tossed on a casino's baize, some come up lucky, others not. Puerto Rico takes the pot, 2.the Dallas of the West Indies, 2.silver linings on the clouds as we descend are hall-marked, 1.San Juan glitters like a maverick's gold ring. And now for 5.plush San Juan. the bright cars, micro-chips. 11.It's sharp and jagged and dangerous, and belonged to some-one else. Brown, S. 'West Indies, U.S.A' in A World of Prose. Edited by Mark McWatt and Hazel Simmonds McDonald. Pearson Education Ltd, 2005. The persona is travelling in a plane, looking down at San Juan, Puerto Rico, as the plane descends. He is saying that this island is the wealthiest in the Caribbean because it has won the jackpot, it has come up lucky. He then points out that he, and others, had travelled to many Caribbean islands and received a hint of the flavour of each island through it's calling card, - its airport - all of which fail when compared to plush San Juan. As they land, they are instructed to stay on the plane if their destination is not San Juan. The persona takes offence and states that America does not want blacks in San Juan, implying that they might be a disruptive force. He notes the efficiency with which things flow, enabling them to take to the skies once more. During the ascent, the persona notes the contrast between the influences of the Caribbean and America. He likens San-Juan to a broken TV, it Iooks good on the outside, but broken on the inside. Line 2: Puerto Rico is compared to dice that is tossed on a casino's baize, it can either come up with winning numbers, or losing numbers. Puerto Rico comes up with winning numbers in the game of chance, as reflected in its wealthy exterior, which is supported by America. Lines 7-8: San Juan's glitter is compared to a maverick's gold ring. The word maverick implies non-conformist, an individualist. This implies that San Juan, Puerto Rico is in the Caribbean, but not a part of the Caribbean. 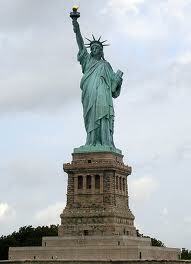 It belongs to America. Lines 10-11: Airports are compared to calling cards. This means that, like a calling card, the quality of the airport gives you an idea of the island's economic status. The airport is also compared to a cultural fingerprint. A fingerprint is an individual thing, therefore the airport gives the traveler an idea of the island's cultural landscape. Line 39: The road is compared to twisted wires. This means that the roads, from above, look both plentiful and curvy. This does not carry a positive connotation, but implies confusion. Line 5: Dallas is an oil rich state in America. Therefore, many of its inhabitants are wealthy, and the state itself, is wealthy. 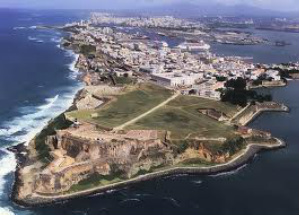 By stating that San Juan is the Dallas of the West Indies, it implies that it is a wealthy island in the West Indies. Lines 5-7: An allusion is being made to the well known cliche; 'every cloud has a silver lining'. It means that behind everything that is seemingly bad, there is good. In the context of this poem, it means that the good, the silver lining, has a mark, or stamp, that authenticates its good quality; it is hallmarked. This implies that it will always have its silver lining showing. Line 20: This statement means the exact opposite of what is stated. The persona is disgusted that Uncle Sam (America) would have such a regulation. This regulation bars anyone from stepping a toe on Puerto Rican soil, if it is not your intended destination. You just have to remain in the air craft, no matter the waiting period, until it is time for takeoff. The persona believes that the Americans are being blatantly discriminatory, and are attempting to camouflage it through the use of regulations. He does not believe that they have achieved their goal of subtlety. 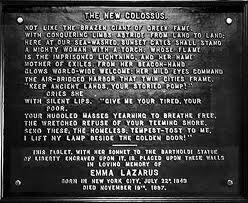 Line 20: The statement, 'give me your poor...' is particularly sarcastic because it is a direct quote from the New Collossus, which rests on a plaque on the statue of liberty, and signifies that the disenfranchised of the world are welcome. The persona, as a member of the 'disenfranchised' masses, clearly feels unwelcomed. Line 26: The persona implies that America is all talk and no action. They really do not want the poor because they bar them from entering and expediently sends them on their way when they enter their airport. The statement is sarcastic because it is loaded with an alternate meaning, due to the contrast in statement and action. Line 17-18: The pun is placed on 'land of the free', it becomes 'Island of the free'. This pun emphasizes how isolated Puerto Rico is from the rest of the Caribbean islands. It belongs to the U.S.A. This state of belonging to, or being owned by the US is asserted through it's insertion into the Star Spangled Banner. This word implies soft, like a teddy bear. It also implies luxury. So San Juan is all of these things. These 'desperate blacks' to whom the persona is referring are the poor people of the Caribbean. If they converge on the glistening San Juan, sucking up its resources, then it might become re-enslaved by poverty. A backyard means one of two things for people. It is a haven where you relax, therefore you decorate it and invest time and money in it. Or, you ignore it and spend all your time indoors, not investing any time, energy or money in it. America viewed Puerto Rico as the latter, a prize in which it saw value. Therefore, when the persona uses this phrase, he is implying that while it is valued, it is still at the back. Slight sarcasm is being used here. When something, or someone, is tantalising, it implies that it is intriguing. The persona, by using this phrase, is trying to draw the readers attention to to the jarring contrasts by stating that he finds them intriguing. The word fierce, used to describe the level of efficiency with which the people worked to get the plane off the ground, shows the extent to which they were not wanted on the island. This implies that the flashiness of San Juan was not authentic. This implies that San Juan is not safe. The cultures are not melding, but jarring against each other. The reason for this is because it belongs to someone else. The contrast in this poem is found in stanza 5. The American cars etc, against the pushcarts. The American culture versus the Puerto Rican culture. The mood of the poem is perturbed. The tone of the poem is slightly bitter, which is fueled by the sarcastic atmosphere.